The new Perrier ad slogan flopped with most focus groups. First year graduates of "Massoud College of Business" (Kabul, Afghanistan) engaged in work study. "Why we must stop the terrorist group hummus." "Apples, Oranges and Grapes rejoice as they go back to their jobs as Fruit of the Loom spokespeople." 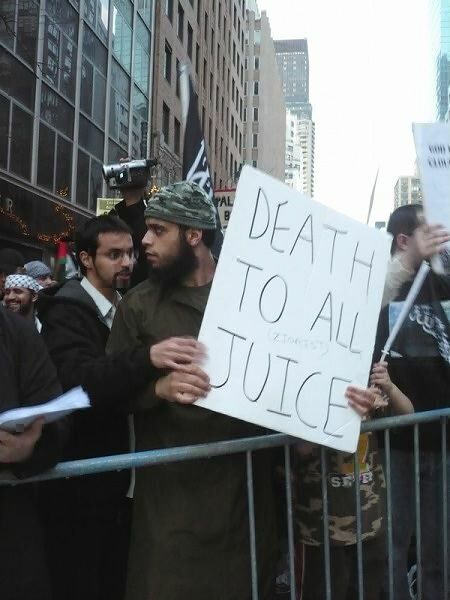 Taking his anger of the world out on juice. . . .how strange. "The soda pop lobby decided to take more extremist measures at their latest rally"
"I do not understand, why is Tropicana sending me a cease-and-desist order? What did I ever do to them?" This is what happens when kids are not allowed to watch Sesame Street. Pineapple I understand because it can be sort of bitter. But just about everyone loves orange juice and apple juice. This guy is just being mean! "What has he been drinking?"